Welcome to this enchanting place, honoured traveller! Sit down and rest your sore feet while we recount the latest gossip, or stroll through our galleries and marvel at the fine art and picturesque sceneries on display. Getting bored, growing restless? Well, adventure lies just down that road. But ere you leave, perhaps you would like to peruse these tomes to strengthen your wisdom and prepare for the perils that may lie ahead. Are ye still around? Looking for assistance or directions, perhaps? Or, I hardly dare asking, have you come to lend a hand? Then stay, friend, and be welcome! 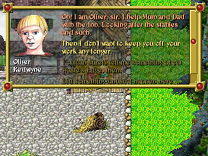 Adonthell is an open source role playing game engine in development since 1999. It is geared towards 2D, graphical, single player games in the spirit of western RPGs like Ultima VII or Planescape: Torment but with the visuals of console classics such as Chrono Trigger or Secret of Mana. The fruits of our efforts will be presented here, most notably the first small but complete demo game, Waste's Edge, available for GNU/Linux, MacOS X and Windows. More detailed informations about the project and resources for aspiring developers are kept on our Documentation Wiki, where they can be maintained and updated more easily.